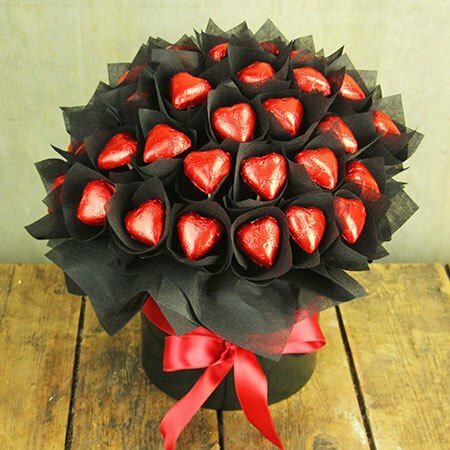 Make like the ultimate romantic Casanova and surprise your sweetheart with this gorgeous gift of chocolate flowers, artfully arranged by our team of professional florists. Using excellent quality Belgian chocolate* (taste tested by our team for the thumbs up), this decadent gift is designed in black and red and delivered in a sophisticated ceramic pot. Perfect for expressing your love, passion and adoration for anyone who has a sweet tooth! *The chocolate used in our edible flower pots is made in Sydney using Callebaut chocolate - a Belgian couveture chocolate manufacturer that makes chocolate with a high cocoa butter content favoured by many gourmet and culinary professionals). In other words, YUM. *PLEASE NOTE: The pictured edible flower chocolate pot is exclusive to delivery in the SYDNEY METRO only.